All system are aviable at 95% or 99% purity levels. /0,5 m3/h and bigger than 3,000 SCFH/85 m3/h. low cost Nitrogen and Oxygen on-site and on-demand. The air we breathe contains roughly 78% nitrogen, 21 % oxygen, .9% argon. The balance is comprised of other gases. The oxygen is separated from the air using PSA Technology. The process centers around a molecular sieve known as Zeolite. At high pressures the sieve adsorbs nitrogen, and at low pressures it desorbs or releases nitrogen. PSA generators consist of two tanks filled with sieve. As high pressure air (about 70 psi) is introduced into the first tank, it passes through the sieve and nitrogen is adsorbed. The remaining oxygen and argon are piped to a buffer or storage tank. Just before the first tank becomes completely saturated with nitrogen, the feed air is redirected to the second tank which then repeats the above process. While this is happening the first tank is then vented to atmosphere allowing the nitrogen to escape from the sieve. To complete the readiness of the first tank, a small amount of the oxygen is used to purge it. This process is repited over and over again until the desired for oxygenlevel is achieved. When clean and dry air is used and under otherwise normal conditions, the sieve will last indefinitely. The production volumen of a PSA generator is dependent on the oxygen purity required. For example, a generator can produce significantly more oxygen at 90% purity than it can at 96%, with a relatively small increase in feed air. By means of a PLC or some other timing based controller, the use may straightforwardly manage the swing cycles on large generators. Purity and flow levels can be selected and optimized based on changing demand. 1. 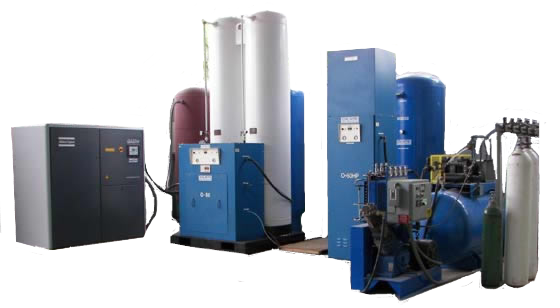 On-site oxygen production at lower cost. - The cost is approximately 25% to 33% of the cost of liquid O2. 2. Output oxygen has very, very dry., Typical dew point -60°C. 3. Low running cost – OGI generators have very low power requirements. 4. Immediately availability Oxygen gas can be obtained after start-up. 5. Automatic control - The OGI system works automatically upon start-up.